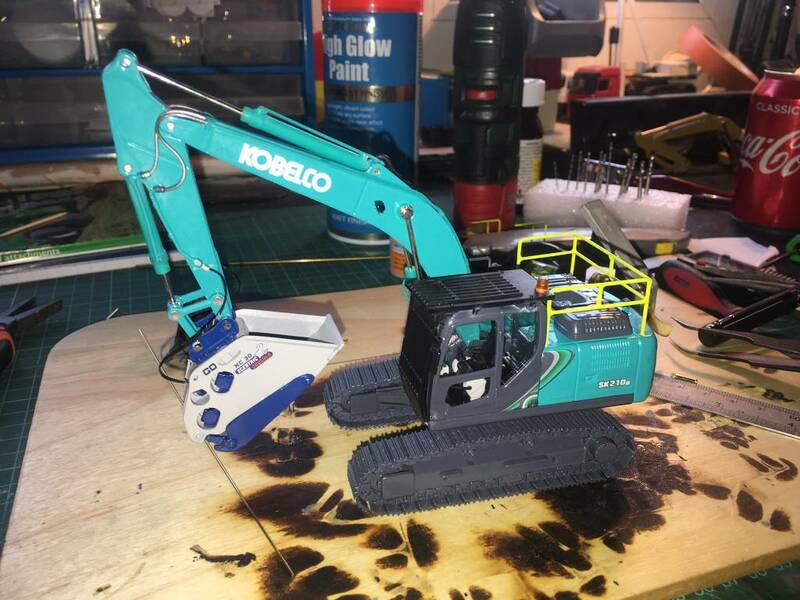 Kobelco Fan Daniel Holland tells us about his customisation of a SK210LC-10 scale model and how he did it. I was given this model of the SK210 at the Molson (Kobelco Dealer) stand at the Plantworx show in 2017 and what I have done to it is quite simple but makes the model pop. Firstly, I handmade a custom boxing ring (handrails) around the top of the machine using 0.8mm brass rods and painted it a fluorescent yellow, this really pops against the blue of the Kobelco machine. For the attachment I used a GEM Models Xcentric XC30 crusher bucket and I also added hand made flexible hydraulic lines that feed the attachment. I have added an industrial scalemodels cab guard which adds great realism to the machine, this also has an orange beacon on top.